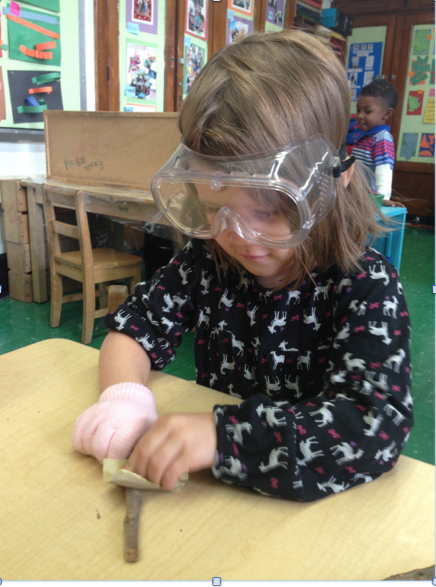 Luckily, I had the pleasure of stopping by Amy Binin’s pre-k class at the Brooklyn New School a few weeks ago. Amy and I met in 1996 when we were both part of a group of New York City public school teachers who were visiting the pre-schools in Reggio Emilia. I never had the pleasure of working in Amy’s class but, when I was consulting with kindergarten, first and second grade teachers at the school a few years ago, I would stop in for a chat when we both had time. Amy understands the importance of curiosity. 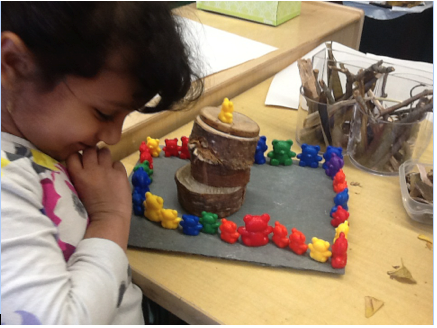 She provides opportunities for children to explore and discover and she listens very carefully so that she can plan her curriculum around their big interests. Here’s a short version of what has been happening in Amy’s class this year. 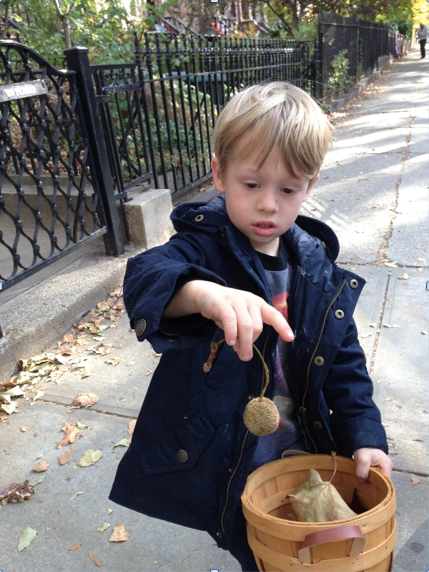 In October Amy took the children on a neighborhood walk. She gave the children bags and baskets for collecting interesting finds along the way. 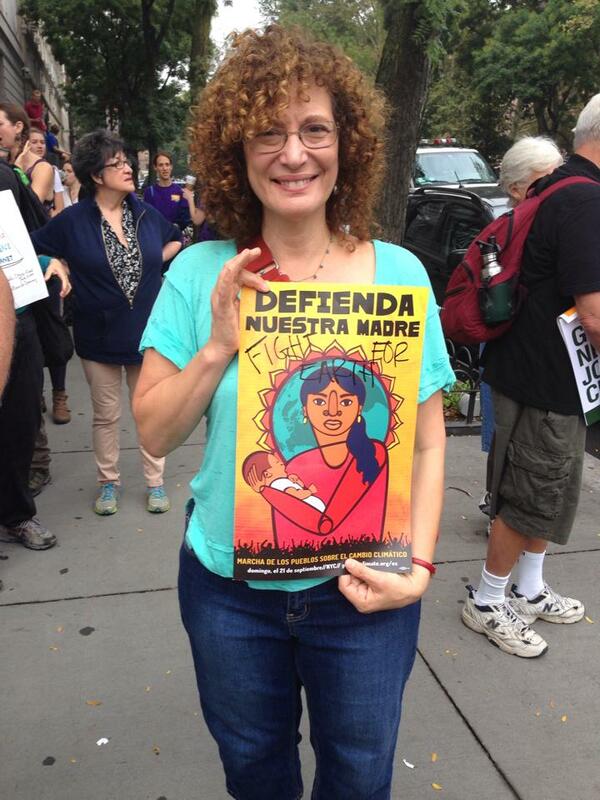 Would this walk open us a path towards an inquiry investigation? Amy had a feeling that something would come from this experience but she was not sure of the direction it would take them. 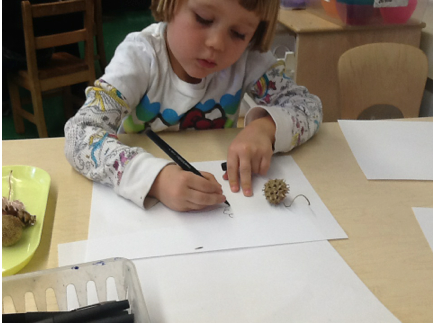 When they returned to class, the children became fascinated with the different seed holders that they found. They could shake some of them and hear the seeds inside but they weren’t sure of how to get them out. Amy didn’t give them any answers. She let them figure out the best way for themselves. Little did she know that the most successful strategy was to place the seed holder under a block from the construction center, put a foot on top of the block and jump real hard. It worked! Obviously this method needed adult supervision. 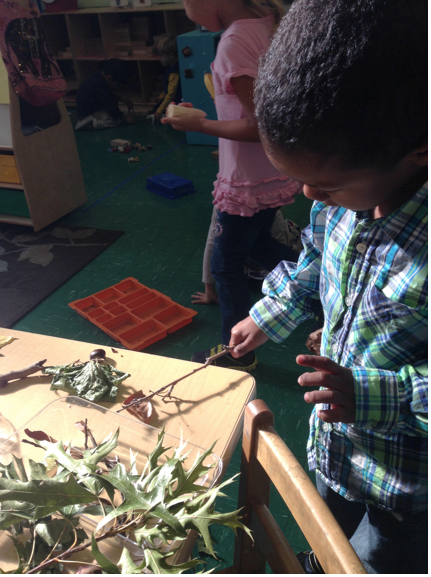 Many seeds were collected when the pods were opened and the children found different ways of examining them. Some children decided to match up the seeds with the seed holders. 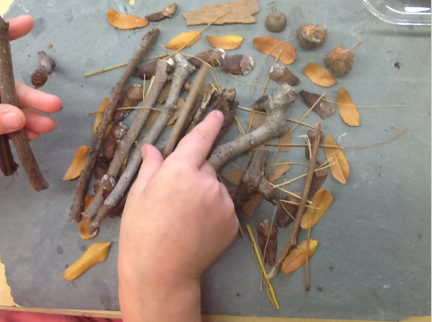 Other children arranged the seeds, twigs and pods in pleasing designs. 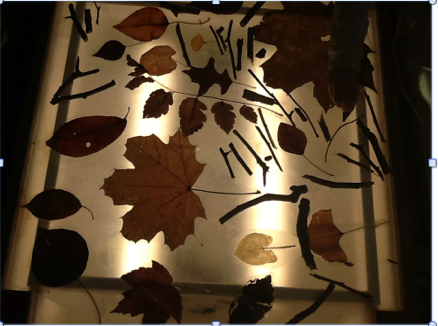 Children brought them to the light table to arrange them along with the different leaves that they collected. 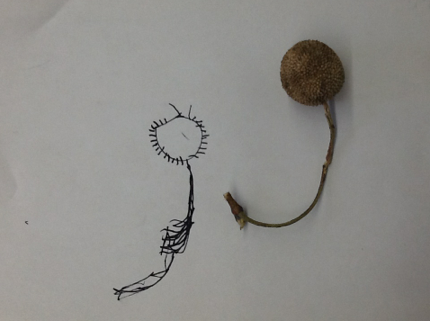 At lunchtime children became aware of the seeds that they found in their fruit. The little apple seeds and tiny orange seeds looked quite different from the big seed in the middle of a plum! 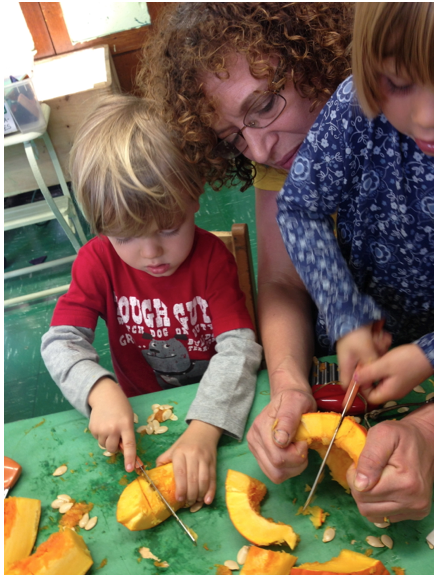 In preparation for Halloween, they cut open a pumpkin and found seeds inside there too! They cooked the pumpkin and the seeds. On their next walk they collected more branches. 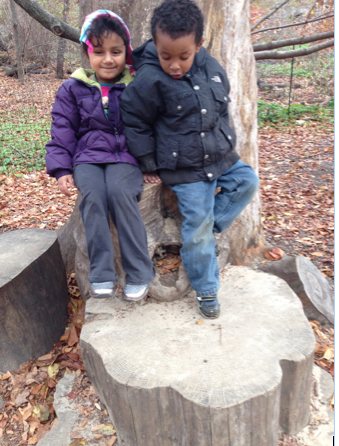 Back in the classroom, the children became interested in the wood that they collected from the trees. They noticed that when they snapped off the “tree skin” from some of the sticks, the spot where the bark had been became smooth and light. Now their challenge was to get the skin off the sticks! and they peeled the sticks. 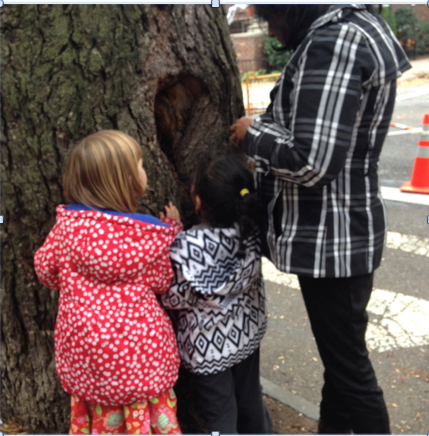 The class revisited the site of their first walking trip and discovered a tree with a hole in it. What could be in there? They put their hands inside and to their surprise they scooped out wood dust. They brought this back to school and compared it with the dust they made while sanding and peeling the bark.This discovery sparked an interest in wood. 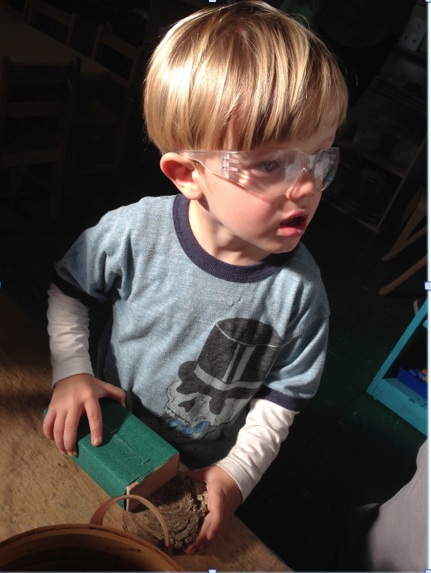 To build on this interest, Amy and a class parent set up a woodworking center. Lots of wood sawing followed! 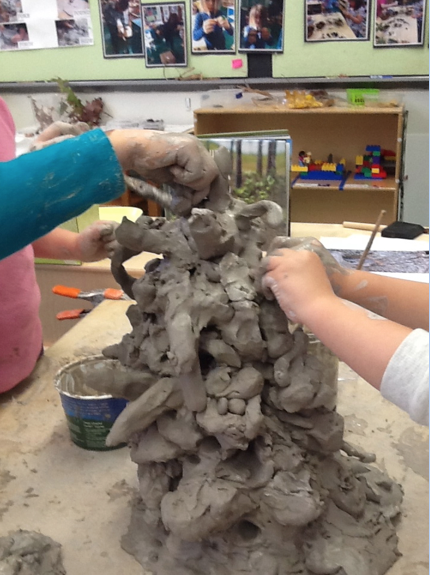 Amy and the children added branches to the block building center and the children began building their own trees. A center for observational drawing was set up. 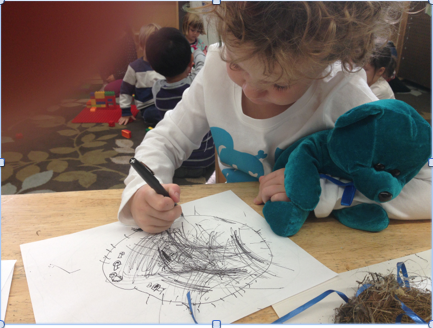 When children look closely and draw what they observe, it helps them to reflect on what they are seeing. 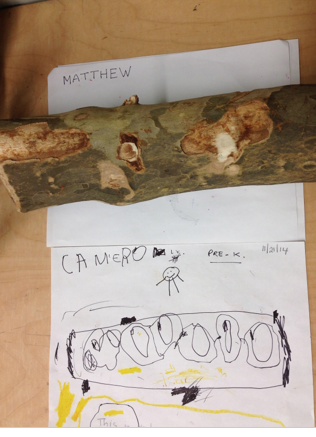 The children drew the seed pods, the bark and the leaves that they collected. 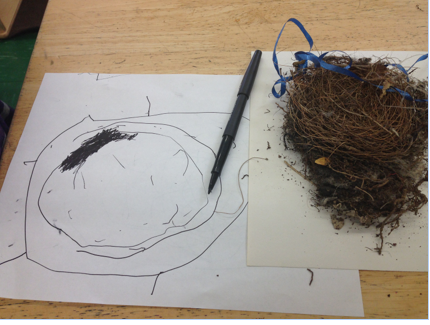 One child brought in a bird’s nest to share and to add to the observation center. 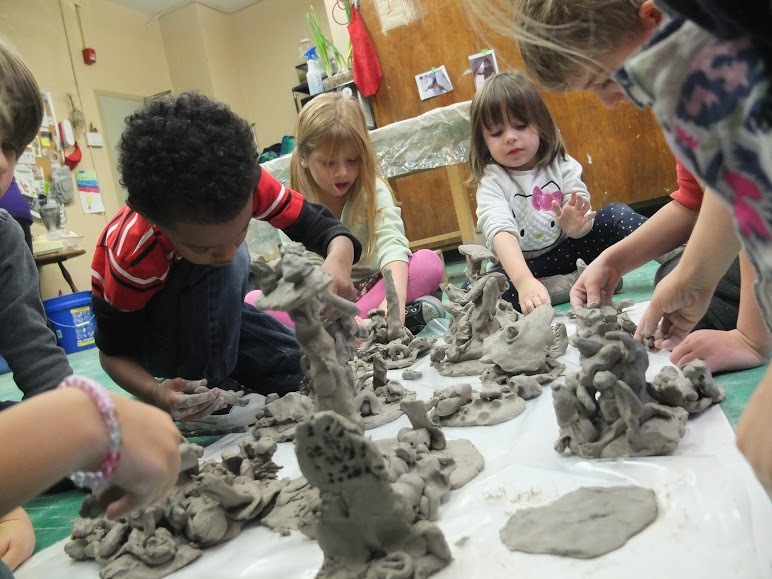 Clay is a very sensual and natural material for young children to manipulate. 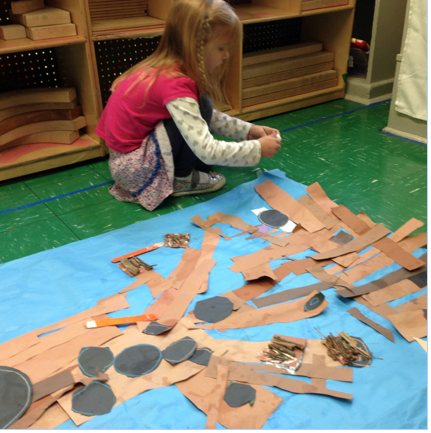 To support the classroom nature study, Rachel Schwartzman, the art teacher, gave the children opportunities to process their understandings by creating trees in the art studio. 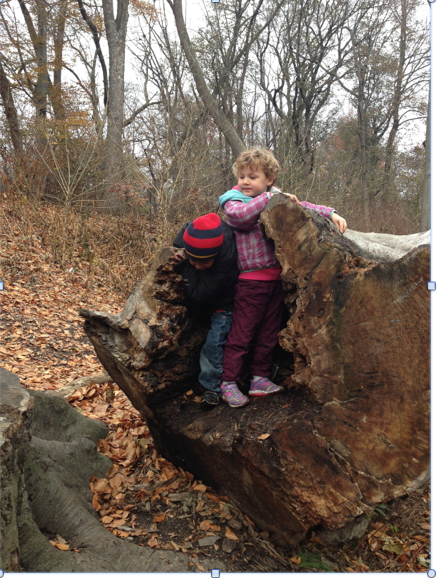 The class took a field trip to vist a Natural Play Space in Prospect Park. 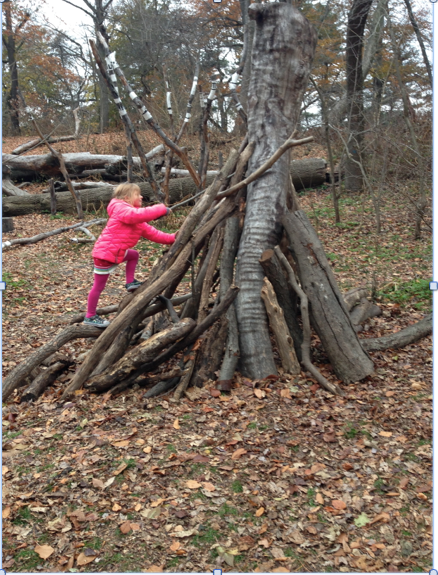 While they were there, they built a house of twigs! 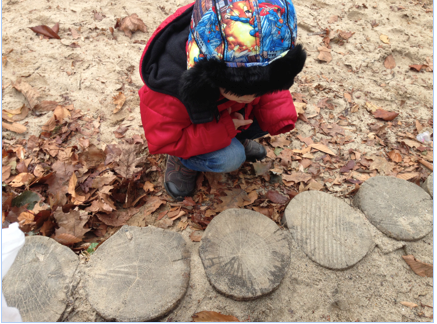 They found a row of tree stumps and became fascinated with the circular lines on the stumps. 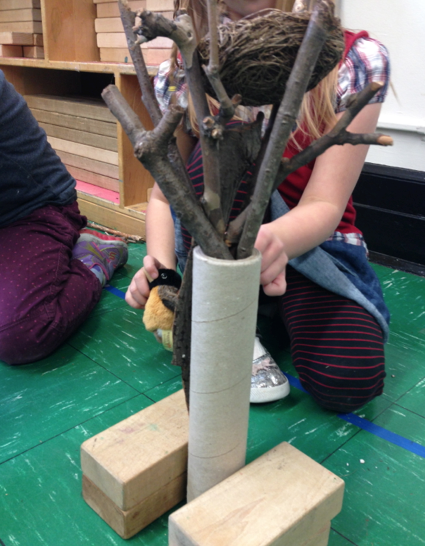 To follow up on this interest, parents who were purchasing Christmas trees asked the tree-seller for the bottom stump of the tree and these tree stumps were brought to class. 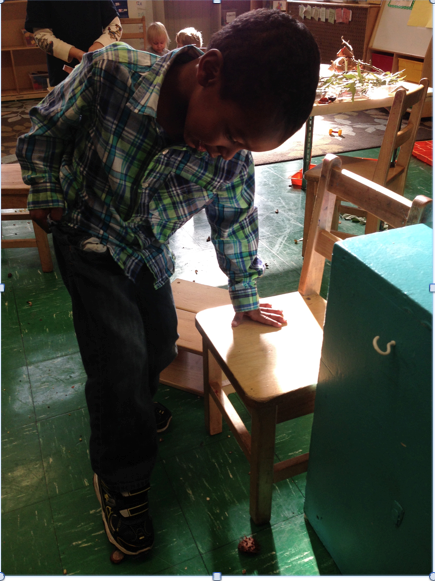 Some were in the science center but they also made their way to the block-building area of the classroom. Amy read many books to the children about trees and about the animals that lived in the trees. The study was culminated with the construction of a large tree that included nests, birds and squirrels. The children now have decided on a plan to change the tree as the seasons change. 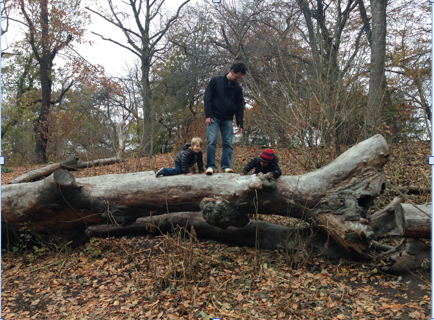 This entry was posted in Investigating Choice Time: Inquiry, Exploration, and Play and tagged Brooklyn New School, light box, Natural playground, Observational drawing, Prospect Park, Reggio Emilia, Seize the, Seize the Moment: Rise to the Challenge of Pre-K, Teachers College on February 9, 2015 by Renee.